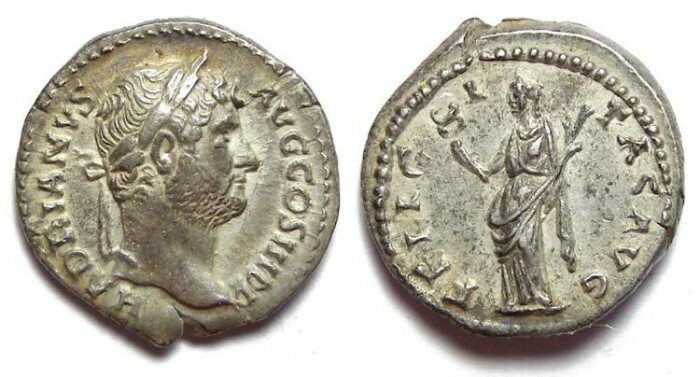 Hadrian, AD 117 to 138, Silver denarius. Date : Issue of AD 134 to 138. Reference : RIC II 234., BMC-608. RSC-615. Size : 17.0 x 17.9 mm. Weight : 3.27 grams. Obverse : Head of Hadrian right, with HADRIANVS AVG COS III P P around. Reverse : Felicity standing left, holding a caduceus and branch, with FELICITAS AVG around. This variation with Felicity hold the branch rather than a cornucopiae, appears to be somewhat scarce.